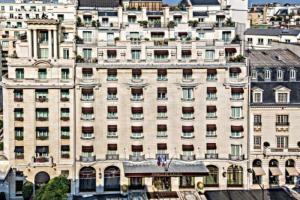 Elegance reveals itself at the Hotel Prince de Galles, a Luxury Collection Hotel, Paris. Built in 1928 during the Art Deco period, this hotel is a legendary place capturing the essence and mystery of Paris. The 138 guest rooms and 30 suites offer indigenous French design and an intimate atmosphere. Muted tones of blue, white and yellow Toile de Jouy patterns typify the elegance and style of the hotel. The Hotel Prince de Galles is within walking distance of historical landmarks, including the Arc de Triomphe and the Champs Elysées, and is located in the heart of Paris on Avenue George V.
Regency Bar - Light meals and drinks; Le Jardin des Cygnes - Elegant French cuisine. Champs Elysées, Eiffel Tower, Hotel des Invalides, Marmotton, Bateaux Mouches, Jeu de Paume, Tuileries Gardens, La Madeleine, Opera Garnier.